A new strange issue in stable 1.21 (and git): animated objects tend to move more slow than their containing object. Causing a visible "delay" in the animations and causing the objects to be misplaced while animating. rEFL620eb070f40f: efl_ui_image: remove job in sizing calc. D6726: elementary image: apply lazy calculation and guarantee retained method. DaveMDS triaged this task as High priority. @ManMower could this be related to your recent animator changes ? it is when the window resizes right that you are talking about? ah, yes, the issue is visible also resizing the window, It's the first time I try to resize the window. think thi is related to window resize. Seems more like swallows are not in sync. This is also visible in all genlists icons, the bigger the icon the more visible the "delay". @raster assigning this to you in the hope you could help with this regression before the 1.22 release. A little bit of debugging information: this is fully related to images. 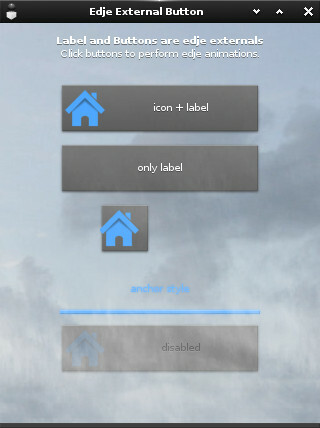 You can replace the icons in the genlist with a button or label, and there is no lacking. A little bit more debugging information: this is related to elm_image, if you replace the elm_icon part in the test_icon.c with a direct evas_image, then everything is fine, no lacking, by the time you make it a elm_image, the lacking starts to happen. All in all the problem is that the position is applied to the content in a job rather than straight away, is there a reason for this ? Reverting D6726 also fixes the issue. @Hermet can you elaborate why the size setting has to be moved to a job ? This job is just a trick optimization to avoid several sizing() calls in one frame. Actually, this is not mandatory we can revert code if it harms image behavior. Hermet added a commit: rEFL620eb070f40f: efl_ui_image: remove job in sizing calc..